An eclectic assortment of knitterly news today. First up, meet the ladies who’ve spent years stitching their entire Kent Village. They painstakingly knit reproductions of every single building in the village, raising more than 10,000 pounds for the Village Hall fund. What an incredible project! Remember the scrumptuous Alchemy Juniper yarn we recently raved about? Clara Parkes is also a fan. Read her review right here. Emily, one of our Point Grey staffers, knit an absolutely stunning lace scarf with some fuschia Juniper. Wish I had a photo. Trust me, it’s jawdroppingly beautiful. 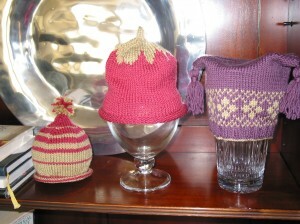 On the left is “Lise”, by Kate Gilbert, in the middle is “Berry Hat” , a Ravelry pattern adaptation and on the right is “Emma”, from Louisa Harding’s ‘Knitting Little Luxuries’ book. (For “Emma”, Julie changed the needle size to make a child’s toque.) They’re all very cute, nice work Julie! This entry was posted on Wednesday, May 27th, 2009 at 12:04 pm	and is filed under Uncategorized. You can follow any responses to this entry through the RSS 2.0 feed. Both comments and pings are currently closed.